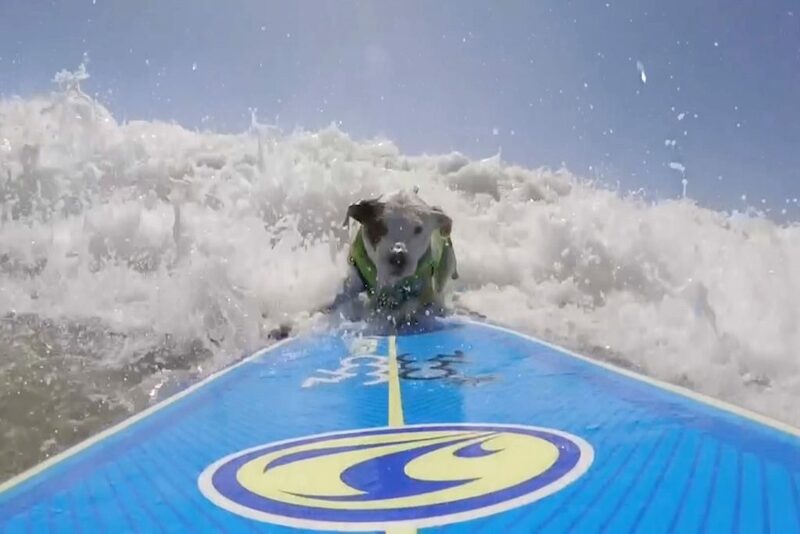 A phenomenal pooch is nailing California’s toughest waves with her top surfing skills. 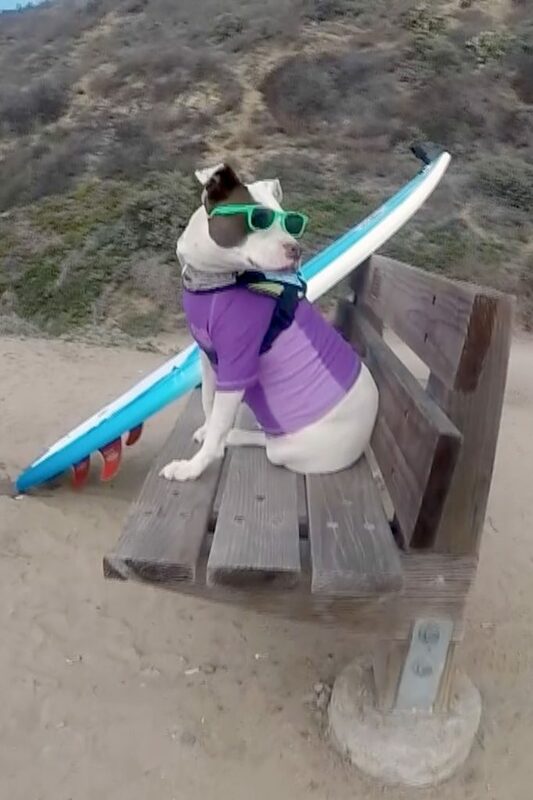 Faith, a young female pit bull, has been gaining international stardom in the last couple years, appearing on the covers of magazines and televisions all over the world with her sun glasses and board under her paw, always ready to hit the water. 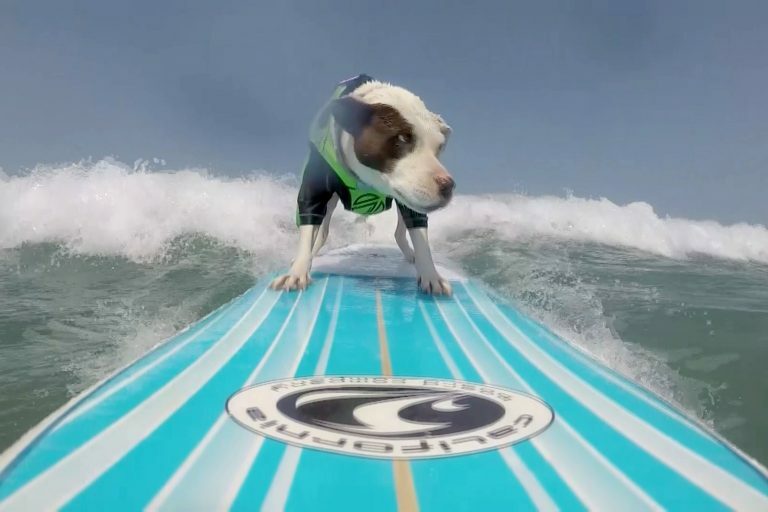 Owner, James Wall, from El Cajon, California, US, has filmed the agile pit bull keeping a steady hold on the board as she slides on top of the waves and towards the beach. Faith also shows off her style out of the water as she trots around with her collection of medals and fancy accessories. James said: “Faith was found with her brother in a garage in November 2012 with a belt around her neck, they were both skinny and very dirty. “I took her home to clean them up, and after no luck finding the owner I decided to keep them. “The following summer I volunteered as a dog surfing instructor for a local animal centre and I had the idea of give Faith a try on the board. “Before we went out to the beach she was introduced to the board on dry land, and once we hit the beach she jumped right on the board. But James said it wasn’t long before Faith entered dog surfing competitions and started bringing home the medals. 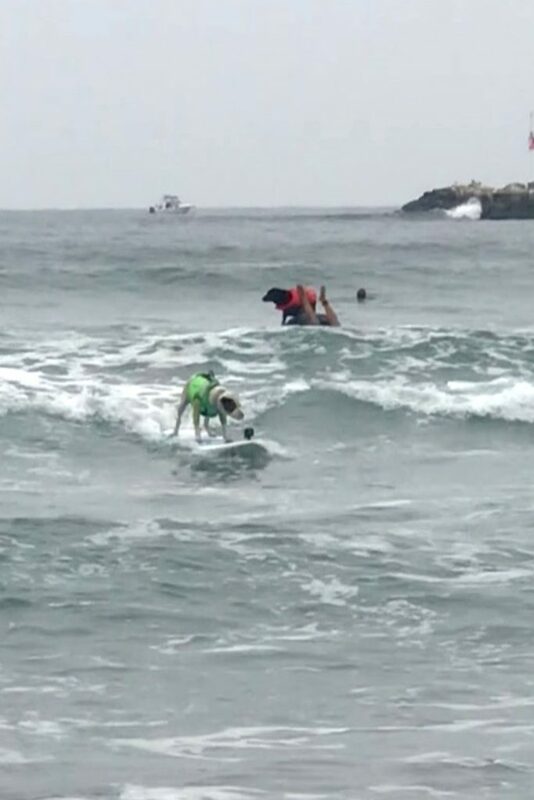 James said: “About three week later we entered the Surf Dog Surf-A-Thon, I figured at least it would be a learning experience, and Faith went out against some seasoned veterans in the sport. “She only had two other trips to the beach under her collar at this time, however she went head to head with the top dog and ended up placing 3rd place in her division. “A couple months later Faith was invited to a dog surfing event in Cocoa Beach, Florida, to be part of the West coast team. “Faith was a headliner to surf against the East coast surfing champion, another pit bull. “She ended up beating the East Coast champ, and finished second place over all in the event. “Since then, she has been invited to compete in the Incredible Dog Challenge twice and has won her division the last four years in a row at Surf-a-Thon. “Faith has been on TV shows and magazines around the world. “When not surfing, she participates in local school events to teach about good dog ownership.